A lot of myths associate themselves with organ donation. While some of them may come close to the truth, the others are just rumours that need to be clarified in order to go ahead with the concept of organ donation. MYTH: You have an age bracket to donate organs. FACT: You can donate organs if you are between 18-80 years of age. Your age is not a barrier to becoming organ and tissue donors. If you are under 18 years, you can make up your mind to donate organs and tissues. Children can donate organs too, with their parents’ consent. MYTH: If I have pledged my organs and I have met with an accident, the hospital will not try to save my life. FACT: The efforts taken by the medical staff would be similar to handing other individuals. In order to be suitable for organ donation, an individual has to be in the hospital. He or she should be on a ventilator and declared brain dead before proceedings for organ donation are initiated. Please remember that organ donation is voluntary and no one can force it. Meeting with a medical emergency after pledging organs doesn’t mean that they would deny you on any medical treatment. There is no disparity reflecting on the medical professionals towards organ donors. MYTH: You need to be healthy for Organ Donation. FACT: Although your health is of prime importance, people with poor health can also donate. The only condition is that the given vital organs they are willing to donate, are in proper condition. 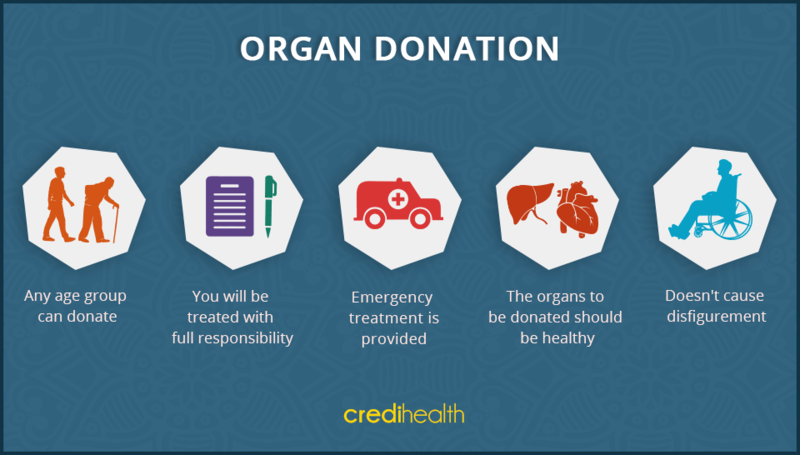 Most of the health condition doesn’t prevent you from organ donation. MYTH: You would be prioritized to receive organ donation if you are rich and or famous. FACT: Your status doesn’t define your priority for receiving an organ. Factors like blood group matching, the length of time being on the waiting list and severity of the disease play a role in classifying high priority and low priority cases. MYTH: Organ and tissue donation causes disfiguration. FACT: Organ donation does not disfigure the body. Skilled professionals perform organ donation surgeries, treating the donor bodies with respect and dignity. Like any other surgery, surgical incisions are not visible as such. Call +91-8010-994-994 and talk to Credi Medical Experts for FREE. Get assistance in choosing the right Liver Transplant Specialist, compare treatment cost from various hospitals and get support in managing other hospital processes.